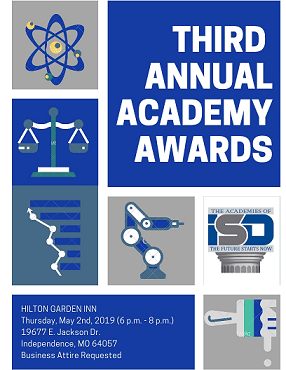 Registration is now open for the 3rd Annual Independence School District Academy Awards on May 2, 2019. At this momentous event we will recognize our Students, Teachers, and Industry Partners for the success of the Academies of the ISD! We hope you can attend as we wouldn't be where we are today without you and your remarkable support. Thank you for giving of your time and talents to benefit students in the Independence School District. We greatly appreciate you! If you are interested in supporting this event, please contact Yvonne Hayes. Reservations are required. Tickets are $25 each.